Wales Elementary School, one of eleven schools in the Kettle Moraine school district of Wisconsin, serves 300+ students from kindergarten to fifth grade. The school is dedicated to personalized learning and to maintaining a strong relationship with students and their families. Each day, the school community pledges to “Be Responsible,” “Be Safe,” and “Be Respectful”. The tragedy at Sandy Hook took a terrible toll, even beyond the families of those who were killed or injured on that day. The shock and horror of school shootings never fades; each incident brings a new wave of fear to American communities. Yet with the shooting at Sandy Hook, even though this had been a reality for many years, the shooting of so many young children, teachers and school personnel brought a new level of anxiety into the classroom and into homes across the country. In the wake of this tragedy, while the states each moved to create new legislation and regulations in an effort to make schools a safer place, many individuals also began thinking on their own about how they could help by developing new products and processes that could be used in schools. While the number and variety of devices proliferated along with active shooter drills and protocols in schools, many of these brought new concerns as to how well they would work or whether it would be realistic to expect teachers to deploy them in a highly stressful situation. It was also essential for students – and substitute teachers – to be able to use any safety products as quickly and effectively as the teachers could. 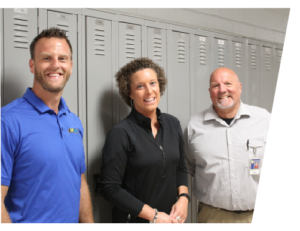 Wanting to take more concrete action to improve safety in their own school, one teacher at Wales Elementary School in the Kettle Moraine School District and her husband began developing a hardware device to solve the problem of quickly locking down a classroom or other school door. One of the fundamental elements of lockdown protocols in the event of an active shooter is that every classroom door must be locked immediately. This posed a concern for four reasons. First, it could be difficult for the teacher to locate the right key, place it into the lock with hands that could well be shaky, and turn it within just a few seconds in a situation where speed is paramount. Next, even if a student was closest to the door, the entire responsibility for locking it falls to the teacher. Third, if there is a substitute teacher in the classroom, they may not have a key or immediately remember where the key is located, further delaying the locking of the door. Finally and most serious, at Wales Elementary school the classroom doors lock only from the outside – so not only would the teacher have their back to the hallway while locking the door, but also after securing the lock, the teacher would not be inside the classroom with the students. Another important factor that influenced the development of the new product was the strong desire to avoid any sense of being in a fortress or a locked-in room. 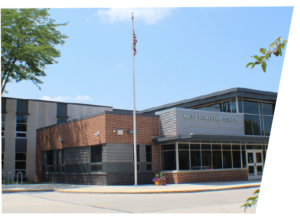 “From an educator’s standpoint, we are still in the business of providing a safe and comfortable environment for our kids, where learning can happen,” said Laura Lloyd, Associate Principal and Co-Director of Safety, Kettle Moraine School District. K-12 teachers did not choose the profession in order to be a part of lockdown drills, nor do they wish to spend their time learning how to protect their students from someone who has entered the facility with loaded firearms and an intent to kill people. In developing this product, great care was taken to make it so easy to use that virtually no time would need to be spent in drilling teachers and students on its use and thus reinforcing the fear of an incident. 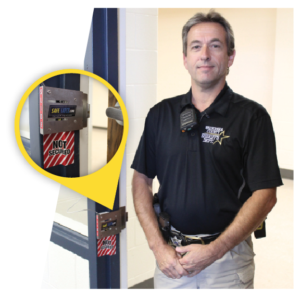 Making the choice to deploy Safe-Latch was easy for Wales Elementary School. Not only does the product solve their most pressing issues, but also it is extremely cost-effective. “It made pure sense to spend much less by simply adding Safe-Latch to our existing door latches, which already operated perfectly. Now we are up to speed for safety,” said Dale Zabel, Director of Facility Services and Safety, Kettle Moraine School District. Once installed, the Safe-Latch product simply becomes a part of the door that students and teachers see and use every day. With Safe-Latch in place, the door can be kept locked at all times, ensuring no one can enter the classroom. Anytime a student or teacher needs to leave the class – for example to use the rest room – they know to simply slide the Safe-Latch into position, allowing the door to open freely without the need for them to disengage the lock. When they return to the classroom, a simple slide of the hardware moves the Safe-Latch and allows the door to lock instantly. Teachers at Wales Elementary school no longer need to worry about having quick access to their keys, nor do they need to worry about having to turn a key in a lock with shaking hands during an active shooter event. Concerns about substitute teachers not having keys readily available are also alleviated with Safe-Latch. “For all of the reasons that we mentioned, it is an important product. The ease of use, the cost efficiency involved – the high visibility for everyone, not just teachers but substitutes and students too. It is reassuring to parents. Safety is a part of our culture, and that is an important reinforcement of that culture. Cost is something that comes into consideration and it does make a very strong statement. I have shared Safe-Latch with colleagues; it’s the product we use, and I wouldn’t promote it if it wasn’t something I believed in,” said Ms. Lloyd. Learn more about safer door locks in our free guide. Endorsed by Hoffman Security Solutions, LLC.